Found these relics while cleaning out my garage. Amazingly enough they work. 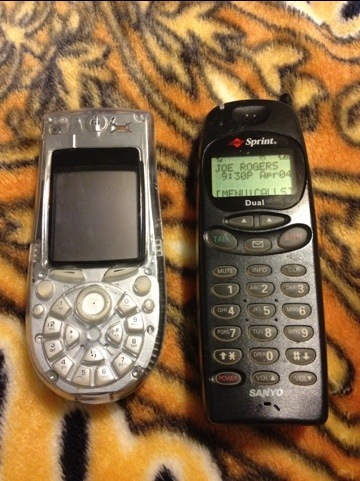 The Nokia is useless since it is missing a sim card, but the Sanyo works fine. I made 1205 calls on it lasting 2952 minutes. That’s only 49 hours; apparently I didn’t talk to much on the phone. Also have some numbers in the memory including Suzanne’s old cell number. I’m assuming it’s old; not bold or crazy to call it to see. That would be weird if she had kept the same number all these years. I wish that the Nokia was working; it would be interesting to see what secrets it held. Not sure what to do with them. I guess I’ll add them to my electronics recycling and toss them away. Move on from the pass and all that.